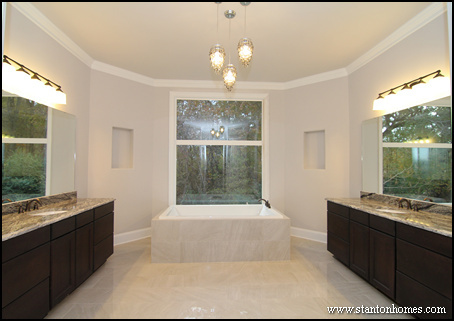 More new homes are gravitating towards shades of white, black, and gray - three colors that will continue to stand the test of time - for master bathroom tile bathtub surrounds. 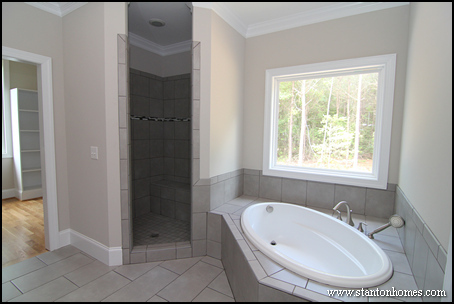 In Raleigh custom homes, these three color categories appear in duos or trios in master bathrooms. 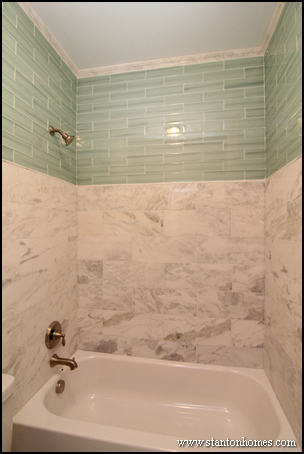 White tile surrounds will continue to captivate home buyers because they are sophisticated, yet simple. 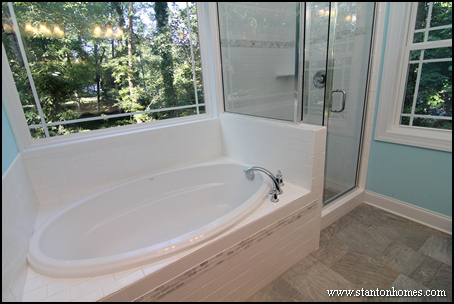 White bathroom tile will open endless decorating opportunities, so you can have more fun designing after you move in. 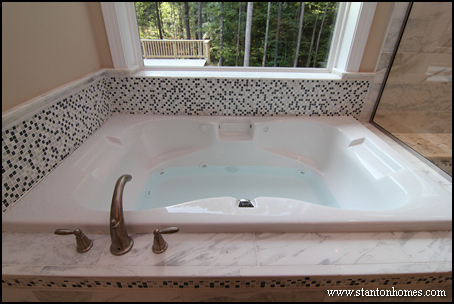 Using a grey and white listello accent (a thin line of accent tile) adds subtle contrast to the otherwise white tub surround. In a setting like this, consider decorating with white curtains and green accessories. The white will keep the room bright, and the green will pull the home's natural setting indoors. The marble surround can add a premium, natural touch, and is contrasted with a mini mosaic. 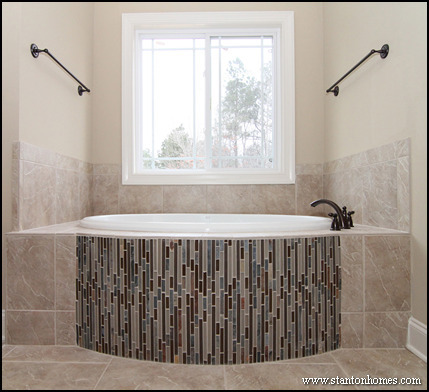 And more Raleigh custom homes will continue to feature mosaic tile patterns in the master bathroom - especially ones that incorporate white, black, and gray. 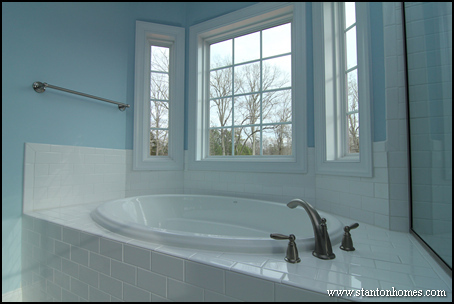 This white and blue bathroom feels like a spa retreat inside - with an angled, alcove tub and serene color combos. Adding a cantilever will increase the size of your master bath, while adding more interest to the exterior. In a high-end bathroom like this, consider decorating with only a few small, colorful (or even clear) accessories. 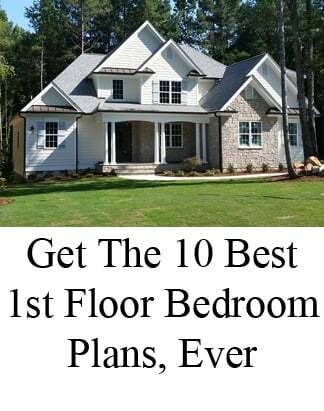 They will make the room warm and inviting, without distracting from the eye-catching architecture. 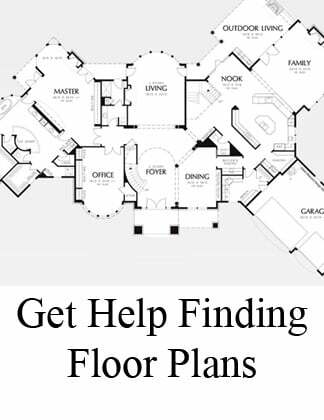 Black is a popular accent color - especially in white and gray bathrooms. Now, more all-black tile surrounds are popping up in Raleigh custom homes - where contemporary and modern home designs lend themselves to dark and black accents. In fact, our design team predicts that more new homes will start to integrate black walls in 2014 - taking these black bathtub surrounds a step further. 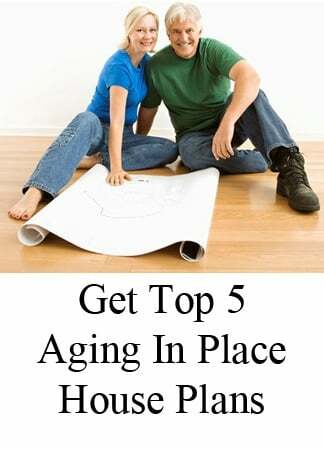 Achieve dimension and texture by using different types of tile. 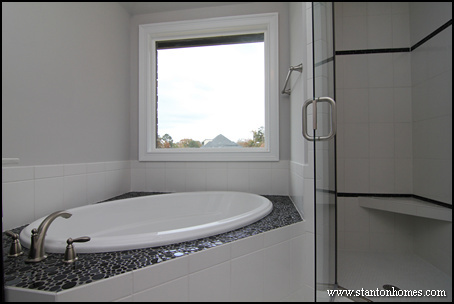 Here, the bathtub surround wrapped in cloudy black 12x12 tiles mingles with the mini-mosaic shower floor. 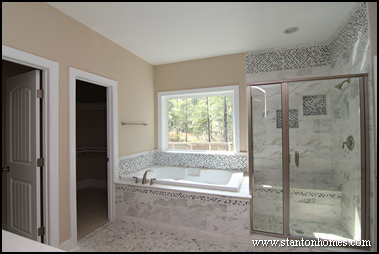 Creamy beige wall color and a pebble listello accent in the shower balance the room with an earthy-modern mix. A black and white color scheme doesn't have to feel too masculine or modern. In this bathroom, a black bubble tile compliments the white tile surround, making this bathroom fun. Grays harmonize the bathroom - no matter what style you love - from traditional elegance to cottage schemes, eclectic looks, and contemporary character. 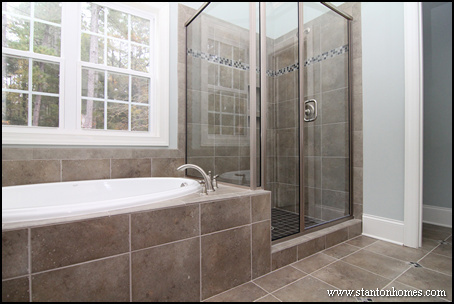 Gray is extremely versatile, and will work well in virtually any bathroom design. The gray bathtub surround, white tub, and pebble walls provide the perfect setting for creative homeowners to experiment with punctuating accessory colors. The walk in shower displays a black, white, and gray listello accent - proving a place to tie in pieces that make a statement, such as black picture frames. Soft grays and crisp whites make this master bathroom a relaxing retreat. Mini-mosaic diamond accents add interest, while gray walls create calm. 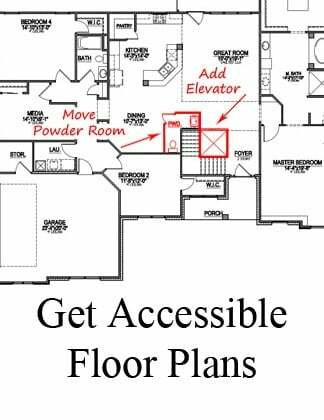 We will continue to see grays making their way into Raleigh custom homes - especially in unexpected places. Slate greys and dark slate are particularly popular additions to listello accents - see an example in the master bathroom of the Maple Lane.